Download the Source Code for This Example Here! Traditionally speaking, creating custom Microsoft Windows Services can be a real pain. 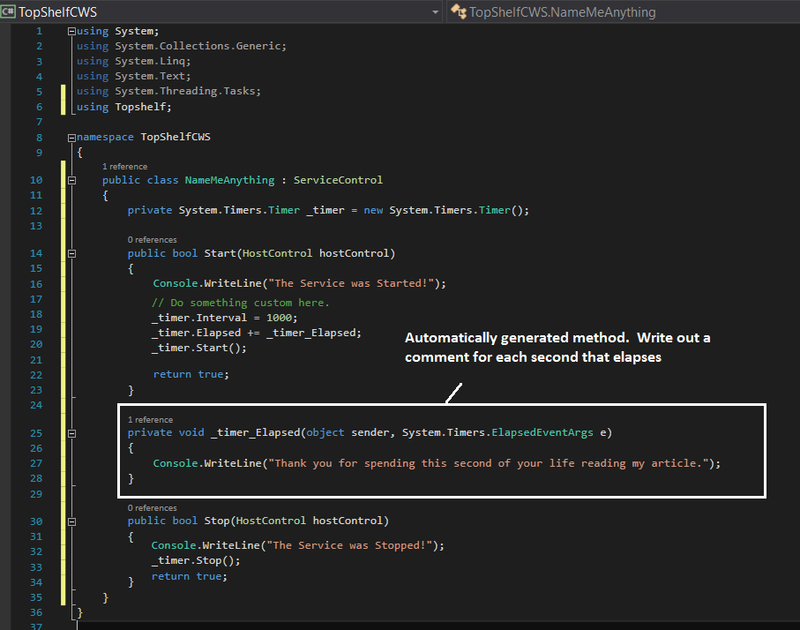 The endless and mind-numbing repetitions of using the InstallUtil command-line utility and Ctrl+Alt+P attachments to the debug the code from the Microsoft Visual Studio IDE are more than enough to discourage the average Software Developer. While many companies are now shying away from writing Windows Services in an attempt to get better optics around job failures, custom Windows Services continue to exist in limited enterprise development situations where certain thresholds of caution are exercised. 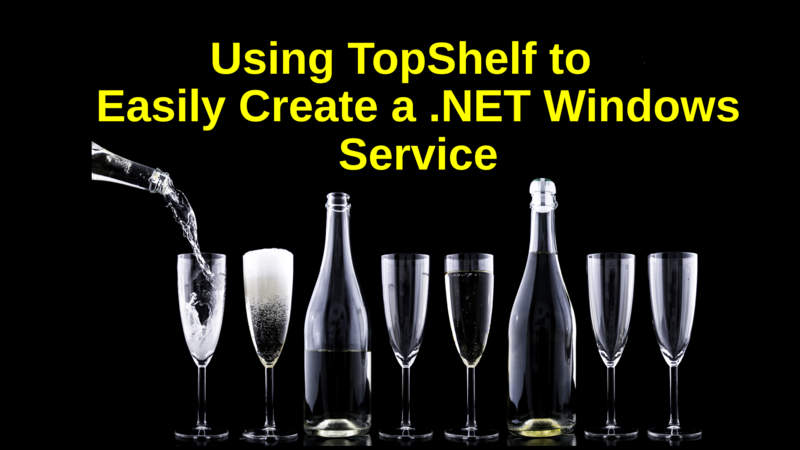 But, if you’re ever blessed with the dubious honor of having to write a custom Windows Service, take note of the fact that there are much easier ways of approaching this task than there used to be, and in my opinion one of the easiest ways is to use a NuGet package called TopShelf. 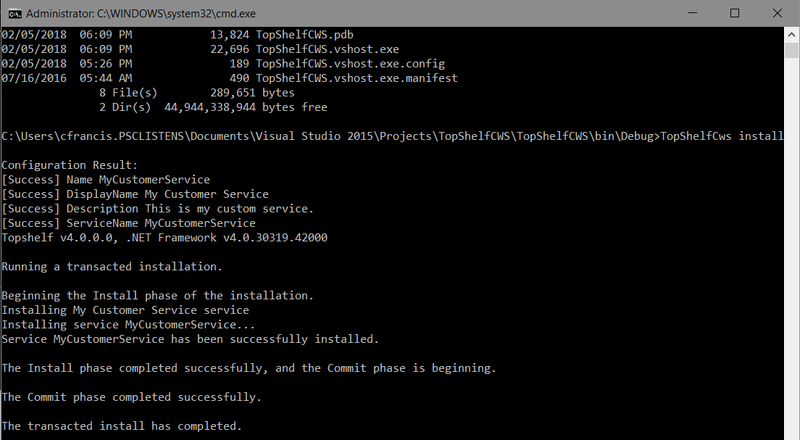 The first benefit of using TopShelf is that you get out from underneath the nuances of using the InstallUtil command to install and uninstall your Windows Service. 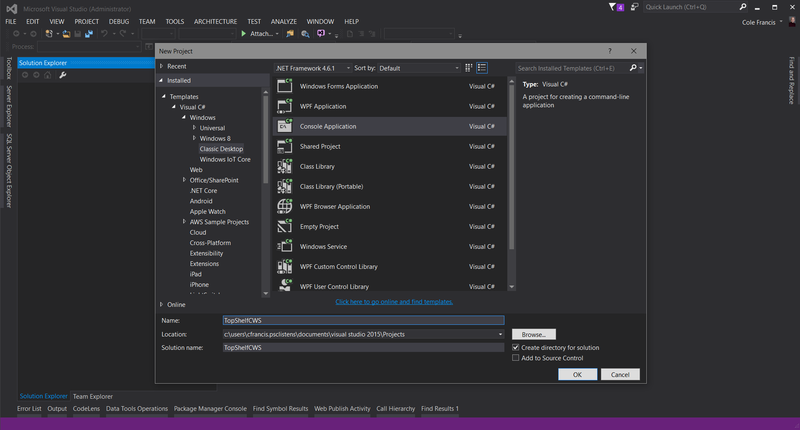 Secondly, you create your Windows Service using a simple and familiar Console Application template type inside Microsoft Visual Studio. 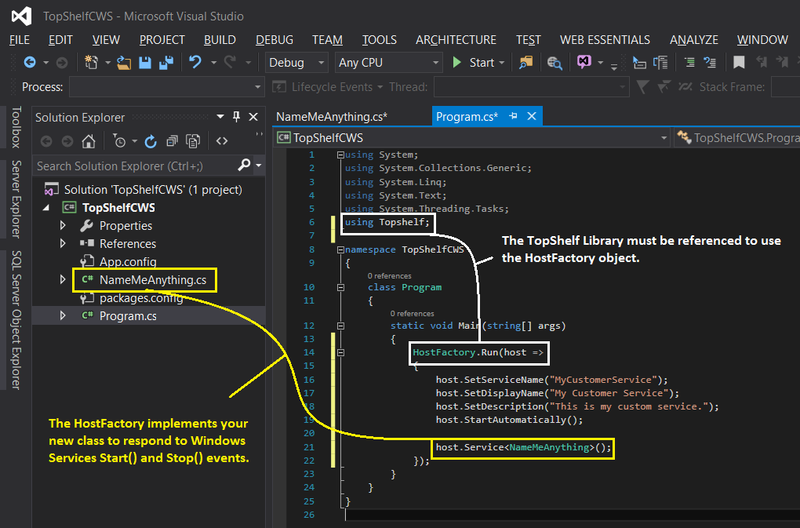 So, not only is it extraordinarily easy to create, it’s also just as easy to debug and eventually transition into a fully-fledged Windows Service leveraging TopShelf. This involves a small series of steps that I’ll demonstrate for you shortly. 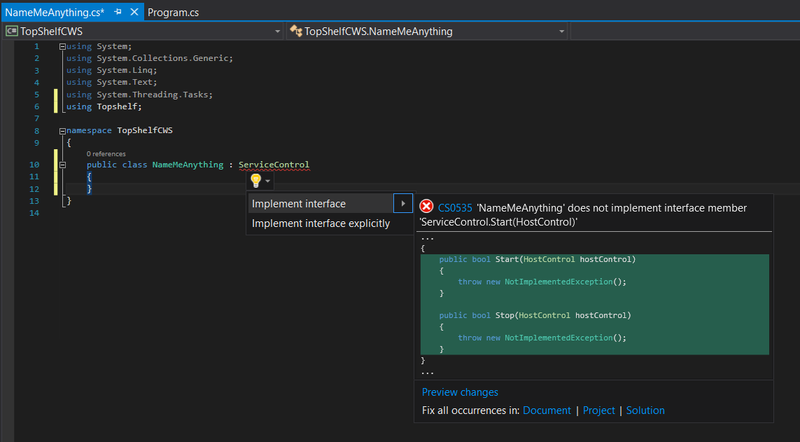 Because you’ve taken the complexity and mystery out of creating, installing, and debugging your Windows Service, you can focus on writing better code. 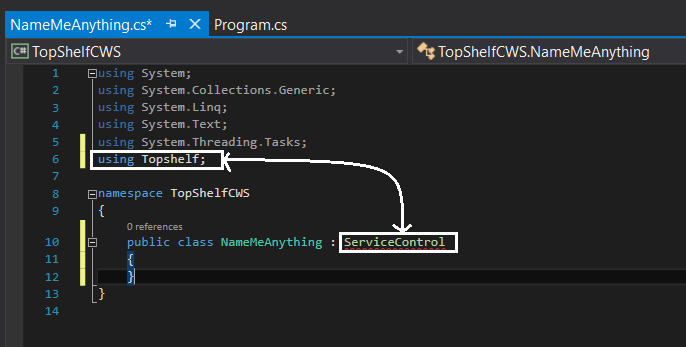 So, now that I’ve explained some of the benefits of using TopShelf to create a Windows Service, let’s run through a quick step-by-step example of how to get one up and running. Don’t be alarmed by the number of steps in my example below. You’ll find that you’ll be able to work through them very quickly. 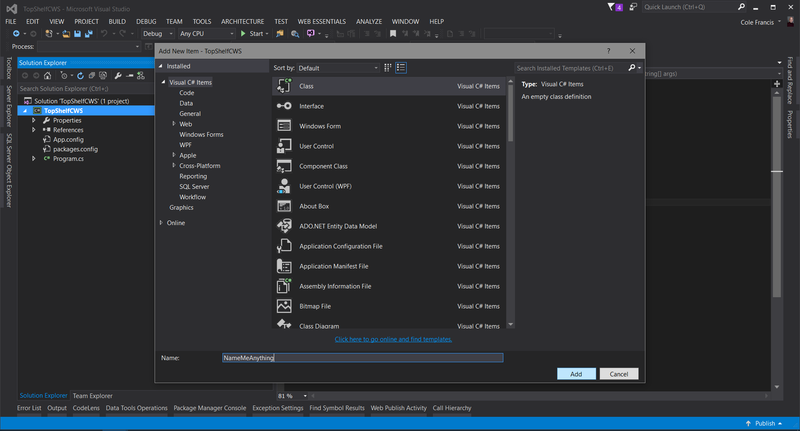 The first step is to create a simple Console Application in Microsoft Visual Studio. As you can see in the example below, I named mine TopShelfCWS, but you can name yours whatever you want. 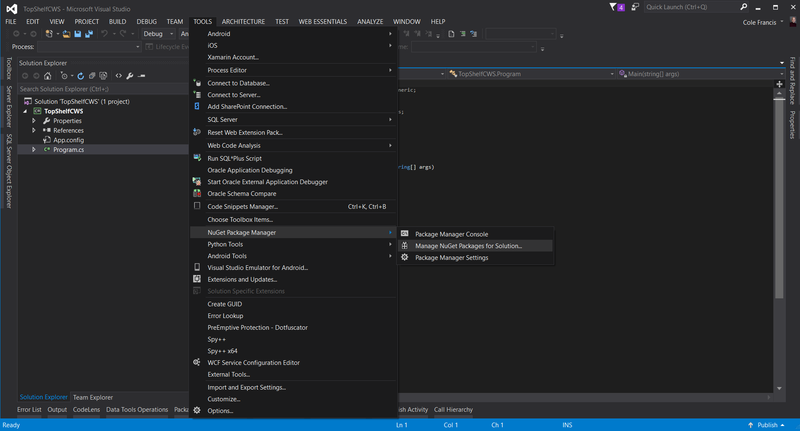 The second step is to open the NuGet Package Manager from the Microsoft Visual Studio IDE menu and then click on the Manage NuGet Packages for Solution option in the submenu as shown in the example below. 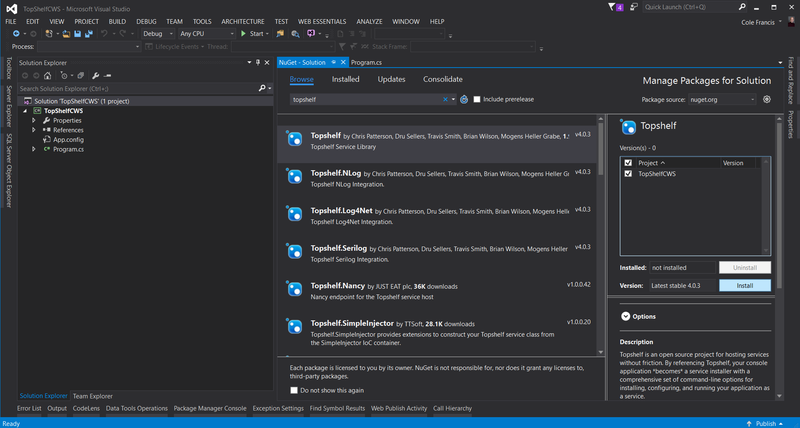 After the NuGet Package Manager screen appears, click on the Browser option at the top of the dialog box, and then search on the words “TopShelf”. A number of packages should appear in the list, and you’ll want to select the one shown in the example below. Next, select the version of the TopShelf product that aligns with your project or you can simply opt to use the default version that was automatically selected for you, which is what I have done in my working example. Afterwards, click the Install button. After the package successfully installs itself, you’ll see a green checkbox by the TopShelf icon, just like you see in the example below. 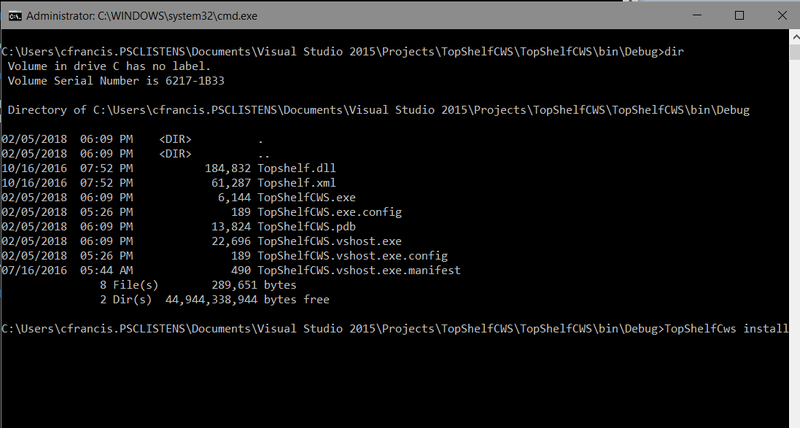 Next, add a new Class to the TopShelfCWS project, and name it something that’s relevant to your solution. As you can see in the example below, I named my class NameMeAnything. In your new class (e.g. NameMeAnything), add a reference to the TopShelf product, and then inherit from ServiceControl. Afterwards, right click on the words ServiceControl and implement its interface as shown in the example below. After implementing the interface, you’ll see two new events show up in your class. They’re called Start() and Stop(), and they’re the only two events that the TopShelf product relies upon to communicate with the Windows Service Start and Stop events. The ServiceName: Indicates the name used by the system to identify this service. The DisplayName: Indicates the friendly name that identifies the service to the user. The Description: Gets or sets the description for the service. For more information, see the example below. Let’s go back to your custom class one more time (e.g. NameMeAnything.cs), and add the code in the following example to your class. You’ll replace this with your own custom code at some point, but following my example will give you a good idea of how things behave. Make sure you include some Console writes to account for all the event behaviors that will occur when you run it. As I mentioned earlier, you can run the Console Application simply as that, a Console Application. You can do this by simply pressing the F5 key. If you’ve followed my example up to this point, then you should see the output shown in the following example. Now that you’ve run your solution as a simple Console Application, let’s take the next step and install it as a Window Service. 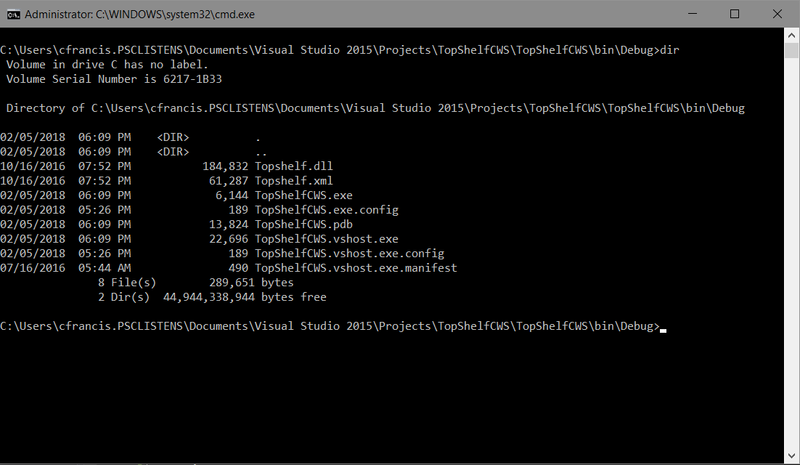 To do this, open a command prompt and navigate to the bin\Debug folder of your project. *IMPORTANT: Make sure you’re running the command prompt in Administrator mode* as shown in the example below. One of the more beautiful aspects of the TopShelf product is how it abstracts you away from all the .NET InstallUtil nonsense. Installing your Console Application as a Windows Service is as easy as typing the name of your executable, followed by the word “Install”. See the example below. Once it installs, you’ll see the output shown in the example below. What’s more, if you navigate to the Windows Services dialog box, you should now see your Console Application show up as a fully-operable Windows Service, as depicted below. 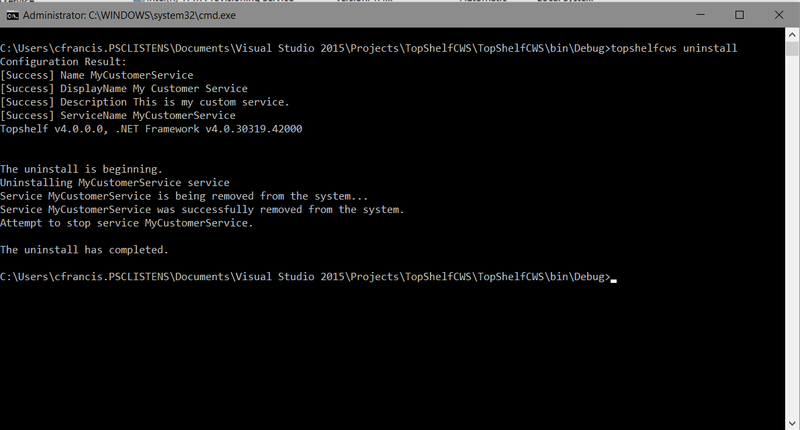 You can now modify the properties of your Windows Service and start it. 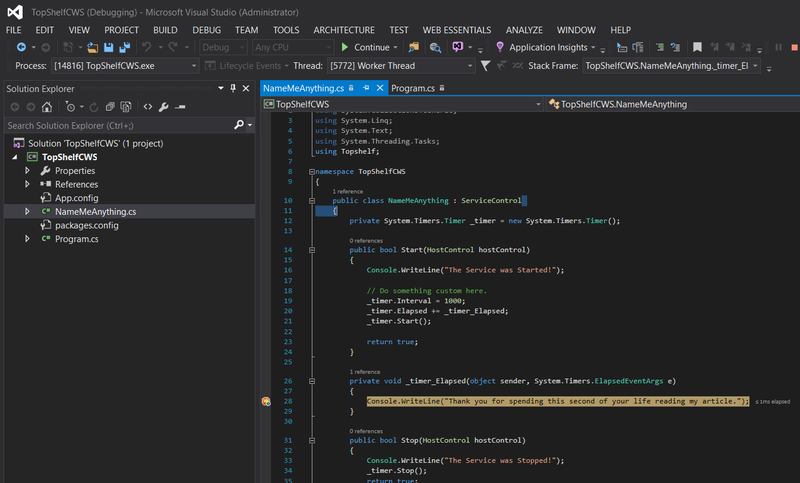 Since all I’m doing in my example is executing a simple timer operation and logging out console messages, I just kept all the Windows Service properties defaults and started my service. See the example below. If all goes well, you’ll see your Windows Service running in the Windows Services dialog box. 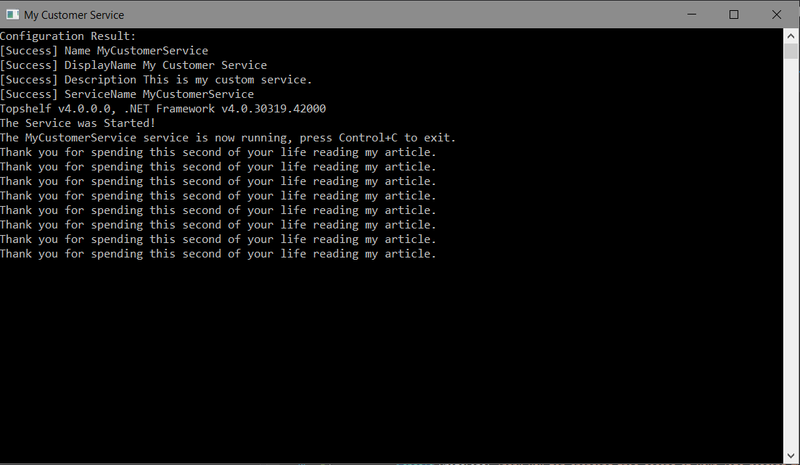 So, now that your console application is running as a Windows Service, you’re absent the the advantage of seeing your console messages being written to the console. So, how do you debug it? 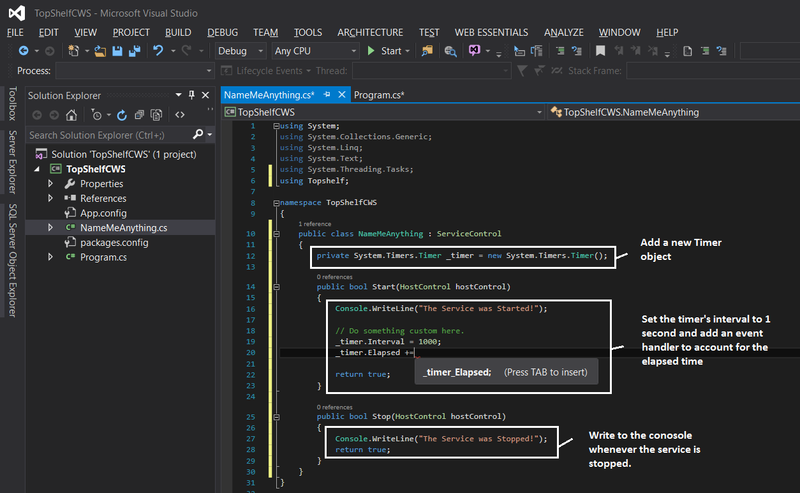 The answer is that you can use the more traditional means of attaching a Visual Studio process to your running Windows Service by clicking Ctrl + Alt + P in the Visual Studio IDE, and then selecting the name of your running Windows Service, as shown in the example below. Next, set a breakpoint on the _timer_Elapsed event. If everything is running and hooked up properly, then your breakpoint should be hit every second, and you can press F10 to step it though the event handler that’s responsible for writing the output to the console, as shown in the example below. Once you’re convinced that your Windows Service is behaving properly, you can stop it and test the TopShelf uninstallation process. Again, TopShelf completely abstracts you away from the nuances of the InstallUtil utility, by allowing you to uninstall your Windows Service just as easily as you initially installed it. 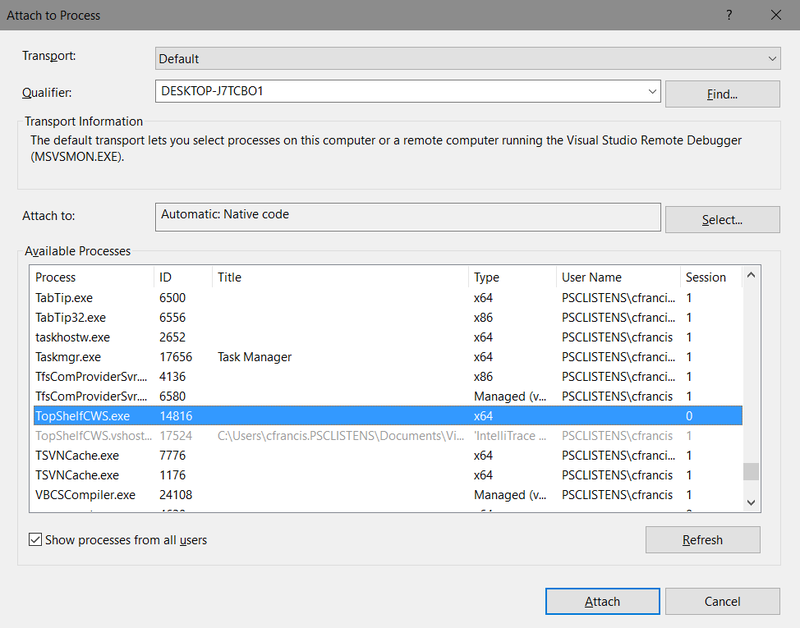 Finally, if you go back into the Windows Services dialog box and refresh your running Windows Services, then you should quickly see that your Windows Service has been successfully removed. 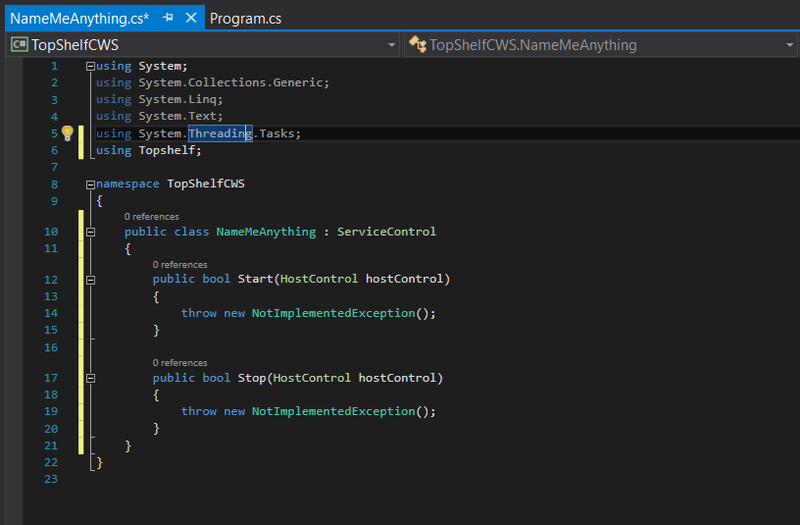 In summary, I walked you through the easy steps of creating a custom Windows Service using the TopShelf NuGet package and a simple C# .NET Console application. 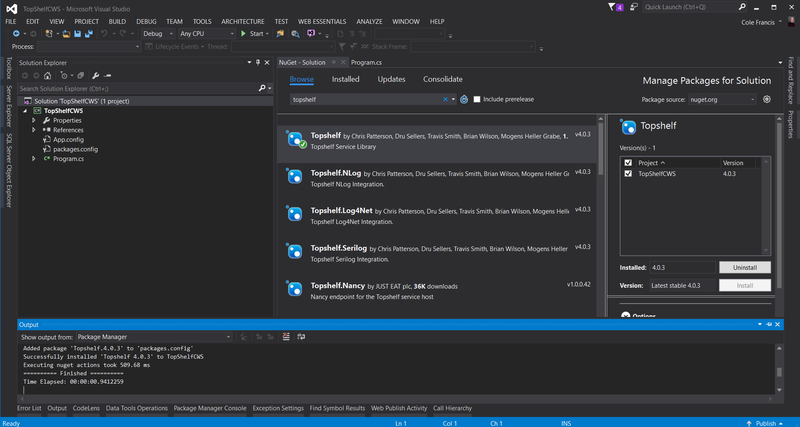 In the end, starting out with a TopShelf NuGet package and a simple Console application allows for a much easier and intuitive Windows Service development process, because it abstracts away all the complexities normally associated with traditional Windows Service development and debugging, resulting in more time to focus on writing better code. These are all good things! Hi, I’m Cole Francis, a Senior Solution Architect for The PSC Group, LLC located in Schaumburg, IL. We’re a Microsoft Partner that specializes in technology solutions that help our clients achieve their strategic business objectives. PSC serves clients nationwide from Chicago and Kansas City.